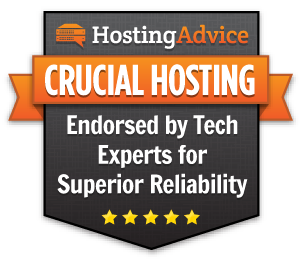 Crucial Hosting was established in Arizona USA May 2006 with a vision of providing highly available, scalable, performance based web hosting solutions and outstanding customer support. Our entire hosting platform is designed from the ground-up to provide the highest possible performance & stability for our client's applications. Our servers are hand built by our staff, and hardware parts are specifically picked with speed and reliability in mind. Crucial owns and operates its multi-homed, fully redundant BGP peered network based in Phoenix Arizona, USA at the enterprise class PhoenixNAP data center facility. Our private cage provides a secure environment for all of our owned network and server systems. We're confident that you will find this uncompromising commitment to Availability, Performance, Scalability and Support to exceed your expectations, guaranteed. Every employee has at least five years of experience providing web hosting, and we're all passionate about improving the industry and our hosting platform. We leverage our experience in order to make custom features and engineer the best possible environment for our clients. If you've ever submitted a ticket, you know how much we care about providing the best possible support to our clients. We do our best to answer our client's questions as quickly and accurately as possible. We're always looking for talented and bright individuals who are looking to help make Crucial Hosting into an even better company. If that sounds like you, please email us at admin@crucialwebhost.com . We make no secret about it &dash; we pride ourselves on being able to provide hands on support to our clients. We aren't a large company with hundreds of employees, and we leverage that fact to make sure our clients feel at home with our company. Instead of getting slow replies by outsourced technical support like most companies, we immediately take action to make sure your toughest needs are resolved as quickly as possible.